I couldn’t miss that the EEB was careful to label this as “opinion.” Why? Because economic growth remains the Holy Grail. It is blasphemous to suggest its pursuit be abandoned. So the EEB had a tinge of courage and published this. But clearly the editors of its online magazine, META, suffered enough cowardice they had to distance and protect themselves from possibly being considered blasphemists. In spite of the celebrity status enjoyed by GDP growth, the truth is that headline is not an opinion; it is a fact. Economic growth IS NOT compatible with sustainability. Another fact: NEVER does anyone bother to label as “opinion” statements implying economic growth solves all problems and is an unalloyed good. 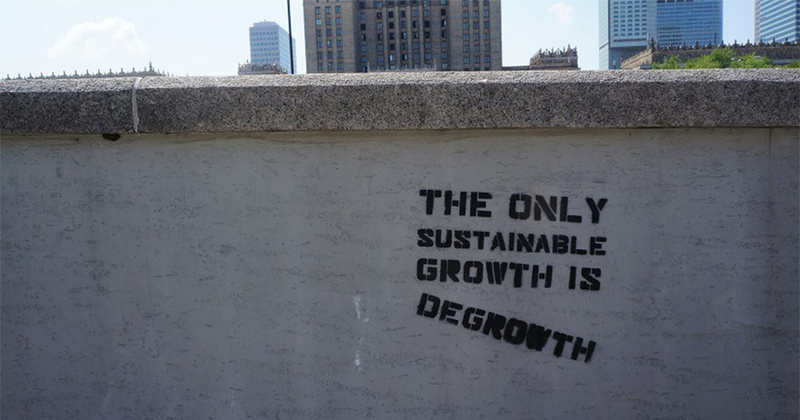 Demaria, an ecological economist at Environmental Science and Technology Institute, Universitat Autònoma de Barcelona, is the co-editor of Degrowth: A Vocabulary for a New Era. So much of Demaria’s commentary here is quotable. We should make posters. The need for this truth-telling is punctuated by the news this week that one of the world’s most ardent growth worshippers is on his way to the U.S. White House. Donald Trump’s choice for chief economic advisor – Larry Kudlow – is a high priest in the church of growth everlasting. I’ve shared a few gems here, but I recommend you read the entire piece. It’s not long. And spread it around. We need an epidemic of realistic truth on this subject. Economic growth needs to be knocked off the pedestal we’ve put it on for far too long.